Demonstrate the love of Christ to all wounded, injured or ill warriors and their families and caregivers. Wounded Warriors at Nebo (WWAN) is an all volunteer, interdenominational, faith-based ministry located in Fredericksburg, Texas. We are a local ministry serving the surrounding communities including San Antonio, Texas. We are a 501(C)(3) organization totally supported by donations 100% of which go back into the ministry. 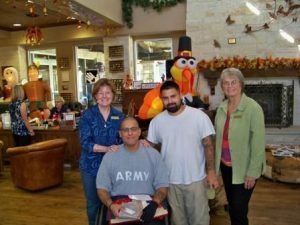 WWAN began in December, 2011, with a community card making event to make 1,000 Christmas cards to be delivered to all the wounded warriors in the WTB (Warrior Transition Battalion) at Fort Sam Houston and the desire to offer R&R weekends in Fredericksburg. At that time we also committed to teaching card making at the Warrior and Family Support Center (WFSC) twice a month. The card classes allowed us to form relationships with the warriors and soon they began trusting us enough to spend a weekend in Fredericksburg as our guests. These first R&Rs were limited to six (6) due to the lack of housing and limited funding. As the ministry has grown, local residents have offered use of their guest house and B&Bs. In addition, some hotels discount their rates so we can house families. Where we used to pray for 6 we now have to limit attendance to 25 to 30. As the number of military participants increased so did the churches partnering with us. A minimum of 12 (twelve) churches support the ministry with volunteers, financially and by providing meals during R&R weekends.